What is a structure ? A structure is a system of inter connected elements to carry loads safely to under ground earth . Lets take a simple example of a table . It has four legs and a timber batten running on these legs, On this timber batten is a sheet of ply made beautiful by pasting a laminate. When a cup of tea is kept on table , a load is added on table. The cup of tea is the load. The ply resists this load and transfers this load to timber battens, they in turn transfer this load to table legs . The table leg transfers this load to floor . No damage done . Lets now assume that 10 people stand on the table . A collapse takes place , one of the following takes place . 3) The legs of the table crack/ give way . In the first place why did the table collapse when ten people stood on it . The reason is table did not have sufficient strength to take this heavy load . In fact it is designed to take light loads of tea cup, dinner plates etc . Structural engineers will say the structure lost its stability due to overloading . Let us now assume one leg of the table is cut . What happens table collapses without any additional load . Structural engineers will say the table is unstable . 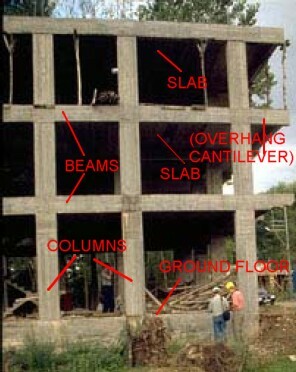 A structural engineer will call the legs of the table as columns , the battens as beams and the ply as slab . Everything you see in this world is a structure . For example take a car . The 4 wheels are the columns, the shell/body is the beam and seat and car floor is the slab. Yes it is a complex structure. When a series of tables are joined vertically and horizontally you get a building structure. Of course now the material changes to concrete and steel instead of timber as more heavier loads are to be sustained . The heights and widths are more to accommodate furniture and people . Basically in building structures there are 2 types of structures, the framed structure which we talked about above and load bearing structure . 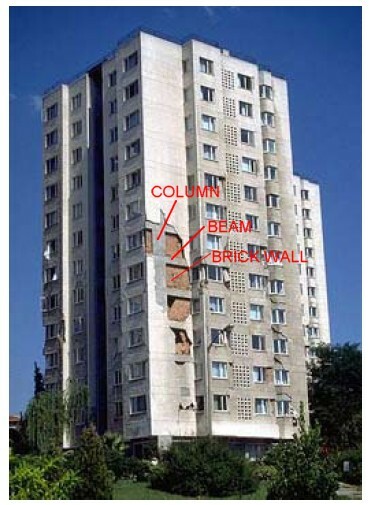 In load bearing structure instead of columns and beams we have walls taking the load . Here the walls play a dual role of taking loads and protecting the inhabitants . The walls are generally brick or stone . Since the walls take the load they cannot be moved or removed . The older structures of 2 to 3 storeyed were load bearing . Today all most all buildings in city are framed structures and are multi storey in nature . In India most of the framed buildings are constructed in RCC . RCC is the short form for Reinforced Cement Concrete . RCC is a composite material that is it is made of concrete + steel . Concrete is obtained by mixing cement , sand, small stone chips, water in required proportion . Steel used is called reinforcement . They are round in shape and can be plain or twisted as per requirement . Reinforcement takes care of the weaknesses the concrete has and hence results in economical composite material . In a framed building , it is the frame which is the heart of the building . This frame is designed by structural engineers taking into consideration a number of factors and various building/ engineering codes . Structural auditing is a process of assessing the present state of the frame . There are number of factors which can make the frame weak such as after construction modifications, different usage of the building, poor maintainance, aging, environment effects etc . Various techniques are used in assessment of frame present status . The most common and initial technique is visual and hammer tapping . Most buildings this suffices . More detailed techniques are used in some cases , they are the non destructive tests (ndt) . Here the samples of materials from frame are collected and tested for certain parameters . Based on the results the assessment of the frame is made . Once in 5 years for buildings . Buildings older than 15 years once in 3 years. However it is advisable to carry out structural auditing every 3 years regularly as many harmful modifications , self inflicted damages get also checked during auditing . 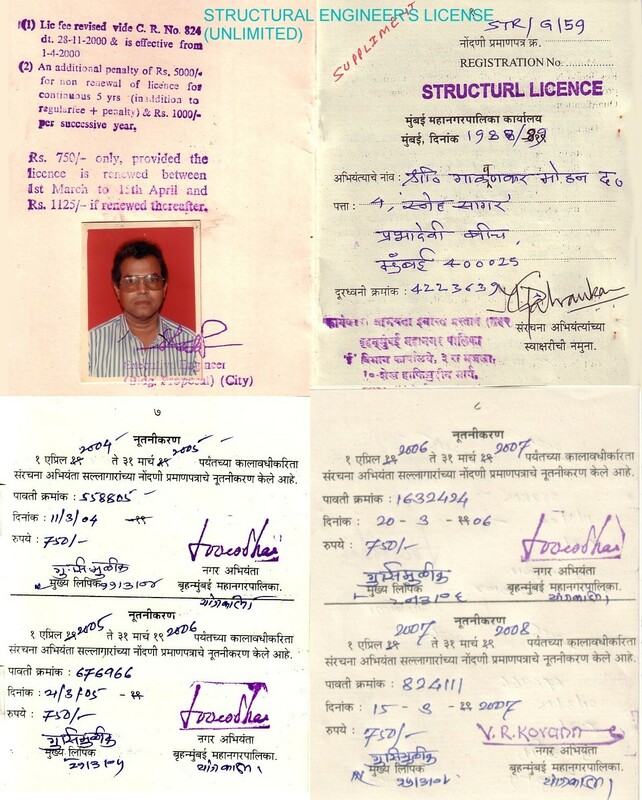 A person who is registered with BMC as structural engineer . The license will look similar to one shown on left .